What do these behaviors have in common? These behaviors can all be signs of sensory overload. Sensory overload is when the body is unable to process, organize, and respond to all the incoming sensory input. The things we taste, feel, smell, see, hear, even our own movement or the motion of those around us, are constantly fighting for our attention. Most of us learn how to tune out or adapt to these distractions when we need to focus on something. But children with sensory processing challenges can struggle to adapt. Their bodies respond by becoming overstimulated and overloaded with sensory input that their brain cannot recognize and adapt to. For parents, it’s important to recognize the signs of sensory overload. 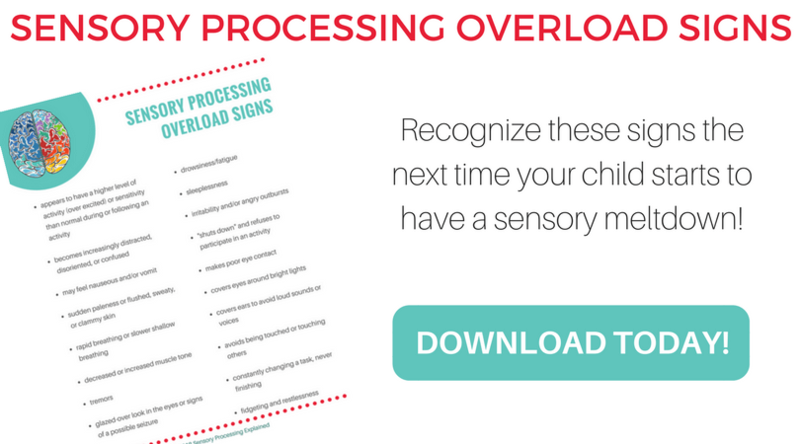 Recognizing the signs will help you respond quickly before sensory meltdowns occur. Once you know the signs, you can step in to reduce sensory input and provide calm down strategies.